» The results of the Mobile Phone Collection project are in! WorldLoop | News | The results of the Mobile Phone Collection project are in! The last day of the European Week for Waste Reduction (EWWR) (25th November) signaled the end of our Mobile Phone collection pilot project as well. Employees of Ordina, Accenture, and ENGIE were engaged through an interactive communication campaign and a quiz about the recyclable raw materials in phones. We are now proud to disclose the results of this pilot campaign. In total, we collected more than 700 old mobile devices, which translates in on average 1 collected phone per 10 employees. It takes 1.9 kg of resources like aluminum, gold and cobalt that need to be extracted and processed to make 1 new phone. Through recycling, we conserve these mineral resources. 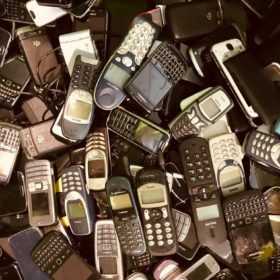 By collecting more than 700 old phones, employees of Ordina, Accenture, and ENGIE managed to save more than 1.300kgs of these mineral resources. Even more promising is the number of people that is prepared to recycle their phones: more than 85% of the respondents said they were definitely interested to do so. Through this campaign we will support an innovative start-up: Recy-Call. Recy-Call was founded by two young entrepreneurs (Domien Declercq & Laura Morel) and is currently following the KBC Start-It program. Recy-Call collects mobile phones through schools and is preparing a large scale collection in developing countries to combat worldwide electronic waste. In other words, their start-up is very closely connected to the mission of this collection pilot. We do hope that with the support we offer them, Recy-Call will be able to further develop their innovative initiative.